Working in the service industry means you must be aware of how important tools are to working effectively and conveniently. As you probably know already, the best tools don’t come cheap. Making use of the latest and the most effective tools out there will most likely take a huge chunk off your bank account. But you most likely won’t mind the sacrifice at and go for them all the same considering how much your business stands to gain. It might then come as a complete shocker to you to discover that one of the most versatile and important tools you can get for your business is extremely affordable locksmith software. Of course, the best tool isn’t necessarily one that helps you figure out locks faster. Sometimes the most complicated aspect of owning a locksmith business is keeping track of all the complicated stuff involved in taking care of business. It is at times even more complicated than fixing broken locks and installing new ones. close more deals and increase sales. keep your customers coming back and you can only do that if your service delivery is spot on and they get satisfaction on any job. Keep a clean and mess-free record that is accurate and readily available at all times. In summary, a great locksmith business needs more than just hardware tools. More than just bolts and nuts, you need to leverage software in order to do business better. Fortunately, there is an affordable locksmith software that helps you do business better and you will be surprised at how affordable it is despite its functionality and effectiveness. FieldSurf is the top field software that is changing the game in the service industry. Everyone from plumbers to electricians and even locksmiths are making use of FieldSurf and they have a long list of testimonials that agrees with the versatility of this unique software. Here are some of the many areas that FieldSurf is turning business around for locksmiths. 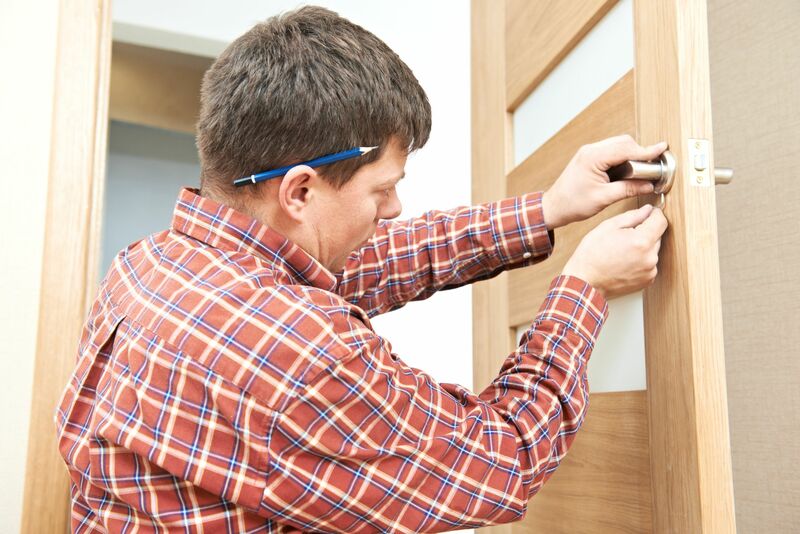 The locksmith business is definitely one that gets a lot of calls. With so many appointments, keeping track of everything at the same time with nothing slipping off isn’t always easy. You just need to ask your front desk staff to see how hard it is to keep track of things. Why do things the hard way when you can get ease at very little cost? 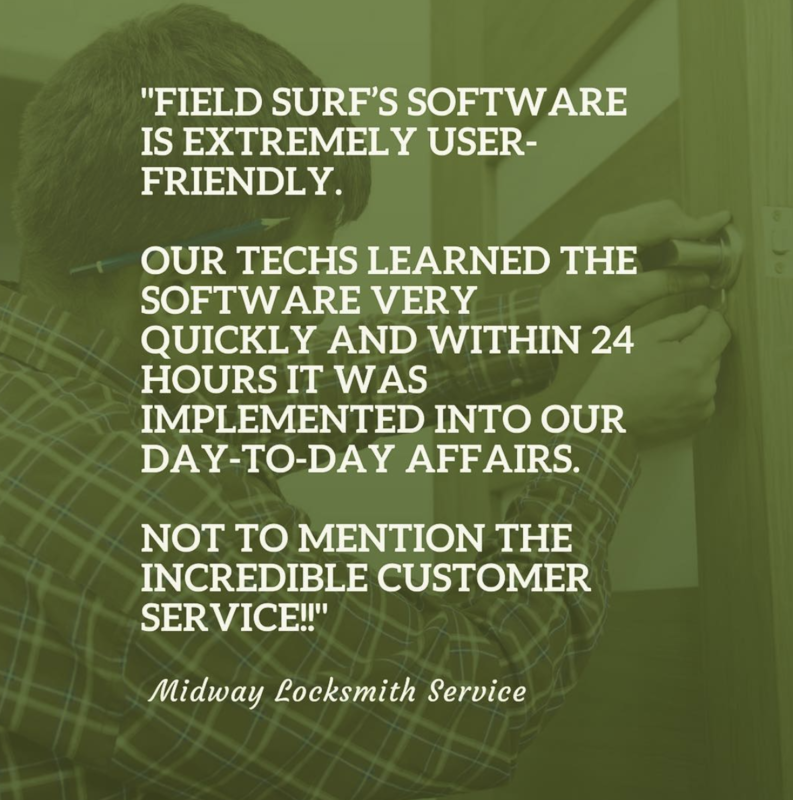 FieldSurf is an effective tool for keeping track of schedules in your locksmith company. Our affordable locksmith software will make sure sales requests stop slipping through the cracks. Take your work orders with ease with FieldSurf: you can record the details of every call that comes in as it concerns the customer and the job that needs to be done. No messy business. It’s a lot easier than you can ever imagine and all the details of the call are probably documented in few easy steps. Separate schedules: FieldSurf helps you avoid clashes in your work order by keeping two distinct calendars, one for regularly scheduled tasks, and the other for new calls. This way, your pre-booked regular appointments will never clash with new ones and you don’t have to ever bother about double booking your technicians. Using SMS messaging provided by FieldSurf, your dispatch staff can effectively send information to your locksmiths in the field. The message is received in real time and the technicians can immediately attend to your clients as fast as possible. What makes this even better is you’re your dispatch staff isn’t just sending out information to workers in the field at random. Using GeoFencing options available on FieldSurf, they are aware of where each of your locksmiths is and their availability. This way they can send a message to only the free and conveniently located field technician. Thus cutting response time and improving customer satisfaction. Wouldn’t you just love a tool that makes your staff work faster and more effectively? FieldSurf helps make this possible. Your technicians are always aware of what your company has and how much it costs so that they can give clients accurate quotes on the go using FieldSurf’s price book. Locksmiths in the field can effectively communicate with the base, keep a record of their activities and record them easily. They can also collaborate on projects by sharing information with each other that will make it easier to work. Invoice: FieldSurf takes invoicing to a whole new level with its electronic invoicing option. Unlike before when preparing an invoice could take days, FieldSurf prepares an invoice alongside the client’s work order. The electronic invoice is sent to the client’s email directly the moment a task is completed. No more time-consuming processing and all the delays associated with preparing invoice manually. Invoice prepared this way is also free from all the errors associated with a manual process or even the possibility of forgetting to send an invoice. Accounting: yes! Good old accounting. This is every business owner’s biggest nightmare. Yet, despite its importance, only a few people ever get a hang of it. Even when you hire an expert to balance the books for you, when it comes to getting much-needed reports from them you might have to wait for days to get something valuable. When they finally do, it’s a lot of paperwork that will take days of analysis to extract the essentials from. However, with Fieldsurf in the picture, you can simply forget anything paperwork. Even the best of accounting software still require a lot of manual inputs but with this affordable locksmith software, every part of the process is fully automated. Your accounting staff can now breathe easy. The best part of using FieldSurf for accounting is how easy it is to get a report on the financial state of your business. The manual paper and pen method will take days or even weeks to compute depending on the volume of your business transaction. But with this software, you can access your accounting information from anywhere in the world with just a few clicks. FieldSurf also provides you with a business analytics tool that you would otherwise not have access to with manual accounting. You can analyze details concerning your business and find like how much sales you are making within a specific period of time, which period of the year is the most profitable to your locksmith business, etc. With this information, you will be able to better prepare for the future and make well-informed business decisions that will move your locksmith business forward. You will realize that with an advantage like this, you are steps ahead of your competitors and is poised to deliver better services to your customers. Having such an effective and affordable locksmith software at your disposal will help grow your business like you never thought possible. Workers payroll: another aspect of your business that goes paperless when you use FieldSurf is your worker’s payroll. This is more than just a software that helps you calculate your staff payroll at the end of the month. FieldSurf automatically calculates and gives you access to payroll information for each of your staff at any specific time within a payment period. FieldSurf automatically computes payment based on time spent at work and all the bonuses and commissions accrued and provide you detailed payroll information even before the month runs out. This information is available on the go and does not require any extra calculations from you at all. One of the essentials of business that many usually have issues with is record keeping. It is important especially in relating with your customers that you keep an accurate and comprehensive record of your activities. While this might have been difficult in the past, FieldSurf makes it absolutely easy. By keeping a comprehensive electronic record, FieldSurf helps to preserve all the information of each of your transactions. Also, this unique and affordable locksmith software keeps a record of all invoices, work orders, and every other detail of your transactions with your customers which makes it easy to refer to them in cases of disputes or just for clarifications in the future. After doing a great job, everyone looks forward to getting paid on time. This is not always the case. As a locksmith business owner, you must be familiar with all the delays associated with receiving payments for your services. Faster invoicing: Delays in payment isn’t always the client’s fault. Sometimes it begins from your own side of the transaction. Delays in processing an invoice can lead to a delay in payment. This is usually the case in most locksmith businesses especially when you still depend on manually preparing your business invoice. It may take days or even weeks before the invoice is ready from your end. And in some cases, you might even forget to send the invoice entirely. On the other side of the transaction, it might take time to confirm an invoice and process payments from your customers as well. When you bring all these together, it might run into weeks before you are finally able to receive payments for your services. This problem is eliminated with Fieldsurf. With this software, the invoice is prepared together with the work order and sent to the customer’s mail the moment the task is completed. No more endless wait for your sales department to process an email. Also, all errors and the possibility of not even sending it in at all is completely eliminated. On-site payment processing: smart businesses are finding better ways of improving cash flow and one of the ways this is made possible is through on-site processing of payments. With FieldSurf, you can now receive payments from your clients right there on the field immediately the task is completed. FieldSurf is America’s most affordable locksmith software, despite its versatility, you will be surprised to know that FieldSurf comes at such a minimal cost that is affordable for all businesses. FieldSurf is also easy to use. It is a cloud-based software that is accessible on all types of devices with internet network capabilities. With so many functions, it might sound like this software is a lot of work. but interestingly FieldSurf is easy to use and requires no programming skill at all. this way you can you don’t have to bother about your field and office staff having issues with using the software. it is completely intuitive and doesn’t take so much effort to understand a use.